Below is a snapshot of the 40 largest companies set to report earnings next week. For each stock, we show its current consensus EPS and revenue estimate, and we also show each stock’s historical EPS and revenue beat rate. On Monday morning, Bank of America (BAC), Charles Schwab (SCHW), and M&T Bank (MTB) kick things off, while Netflix (NFLX) will be on everyone’s radar after the close. 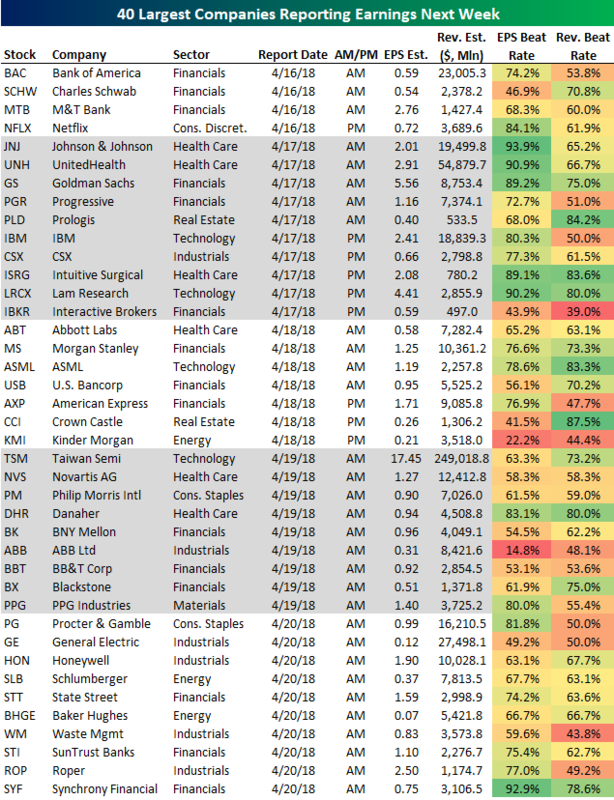 On Tuesday morning, we hear from big Dow 30 stocks like Johnson & Johnson (JNJ), UnitedHealth (UNH), and Goldman Sachs (GS). IBM is the biggest stock reporting on Tuesday after the close. Morgan Stanley (MS) is one of the last big brokers to report on Wednesday morning, and then American Express (AXP) reports its Q1 numbers on Wednesday after the close. Thursday we’ll hear from Philip Morris Intl (PM), Taiwan Semi (TSM), Danaher (DHR), and PPG Industries (PPG), while on Friday morning we get numbers from a number of blue chips like Procter & Gamble (PG), General Electric (GE), Honeywell (HON), and Schlumberger (SLB). Of the stocks listed below, JNJ, UNH, GS, ISRG, and LRCX have historically beaten EPS estimates the most often.